Steven Kellogg is one of my favorite authors, and his books definitely lend themselves to the word choice trait. 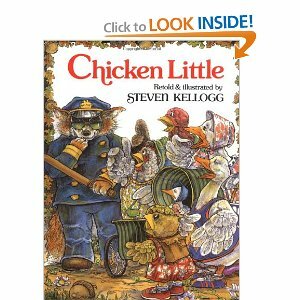 I particularly love to use Kellogg's versions of Chicken Little for word choice since you won't find the word "said" anywhere in this book. While I read the book aloud, students list words used instead of said on an index card. Then we share out and make a master list. On a subsequent day, students work in partners or small groups to categorize the words from the chart. I allow each partner/small group to determine the categories themselves. This leads to interesting discussions. I love that idea! We have also been working on word choice in my fourth grade classroom. A colleague of mine had a great lesson for using better action words (instead of boring words like walk or went). We read a book called The Great Fuzz Frenzy by Janet Stevens. First, the students wrote a story about the things they do to get ready for their day. We talked about the difference between verbs and action verbs. I read the story, and they had to write down all of the action verbs they heard. Then, the students went back to their stories to change boring verbs to action verbs. The book is so cute and the kids loved it!